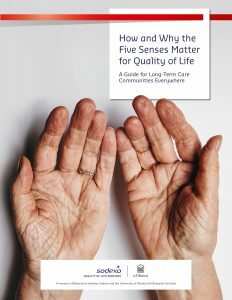 New Global Ageing Network Board Member Laetitia Daufenbach shares news of a recent study on the five senses and why they matter for enhanced quality of life. Laetitia is the Global Head of Strategy for Sodexo Seniors. She begins her board membership in January 2018. We experience the world through our senses. Almost everyone will experience an impairment of their senses as they age. But those changes don’t have to get in the way of a full and positive life. 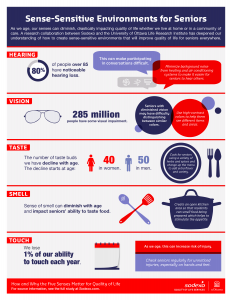 To explore this, Sodexo partnered with the University of Ottawa’s Life Research Institute to deepen our understanding of sensory impairments in seniors. The study inspires new thinking from simple, everyday practices to technological innovations to continually raise the level of care for seniors. In many ways, focusing on the senses is common sense. Many long-term care communities, for example, already know how important it is to reduce loud noise and less-than-pleasant smells. But they may want to rethink the basics to address all of their residents’ needs. Issues such as glare from floors can affect residents with cataracts or the humming of the heating and cooling systems can impact residents with hearing aids. We should think about all five senses to create environments that improve quality of life. Provide seniors the opportunity to listen to nature sounds such as birds chirping, waterfalls and water rippling. The right kind of auditory stimulation can enhance mood and promote relaxation and cognition. Use different colored lights for different times of the day (e.g., blue lights during the day and red lights at night). Seniors with diminished vision may have difficulty distinguishing between similar colors. Grow therapeutic kitchen gardens. This can be a good source of food for the community as well as a healing activity. Use cooking and baking smells to stimulate pleasant memories. Smell is connected to a part of our brain that triggers memories; a poor sense of smell can lead to depression. Offer animal therapy visits to engage sense of touch. Touch simulates the release of the hormone oxytocin, which helps with relaxation and social bonding. For more on the study and ways to measure quality of life in your community, visit Sodexo’s website.